Dry rot, also known as brown rot, is one of the most detrimental forces to household wood in the world. Approximately 20 billion board feet of timber is destroyed by wood rot in the United States each year. More wood is destroyed by dry rot each year than is damaged by fire! Wood rot in general leads to about 17 billion dollars of damage in the United States annually. At Ayers Basement Systems, we have a long history of experience in eliminating, preventing, and controlling dry rot infestations in homes throughout Michigan & Indiana, including Ionia, Big Rapids, Grand Haven, Cadillac, Charlotte, Ludington, Coldwater and areas nearby. If you have a dry rot problem in your home and would like more information, call or e-mail us today for a free dry rot control quote! "Dry Rot" is a term most often used to describe a particular kind of dry, cracking, rotting wood. Dry rot actually stems from a variety of brown rot species, mainly the "true" dry rot fungus known as Serpula lacrymans. Dry rot survives on much less moisture than other types of wood rotting fungi. Dry rot only needs a wood moisture content of just 28-30% to survive. Some contractors have also noticed that dry rot also will not grow on wood with too much moisture, although this is not a fact. Dry rot fungus spores are present in most homes and can survive for several years until the right conditions to grow present themselves. Dry rot is not the most common type of rot, but it can be the most damaging to your home. Dry rot can endure conditions that are too dry for other types of rot to thrive. In fact, up to a 75% loss in the toughness of the wood [PDF] is possible with just a 1% decrease in the wood's weight of the wood. Dry rot can pull moisture from moist areas to dry areas. It grows through concrete, mortar, masonry, and even behind plaster! Dry rot problems in basements and crawl spaces can easily be solved by sealing and dehumidifying the space. An accumulation of fungal spores that are covering the surface and appear as "red brick dust" are a common first indication of dry rot in a home. These fungal spores are actually just waiting for the proper conditions to begin growing. Dry rot tends to occur several months after a household water event, such as flooding, a failed water heater, bursting washing machine hoses, or leaking pipes. Dry rot can also be found in vented crawl spaces and basements with groundwater flooding. Remove All Damaged Wood: All wood that shows decay or visible fungus needs to be removed, as well as all wood within one meter of the visible decayed material. Ayers Basement Systems can help you eliminate dry rot problems at their source. We can dry your basement or crawl space, eliminate flooding problems, and seal out humidity. We offer FREE, no-obligation dry basement and crawl space estimates in our service area. We can answer all your questions and point out the sources of humidity and moisture in your home. 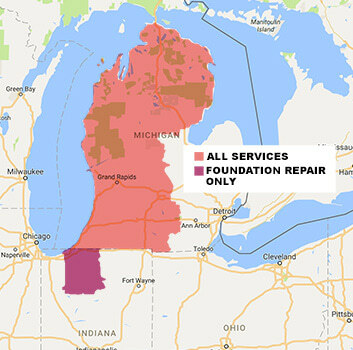 We service Michigan & Indiana, including Ionia, Big Rapids, Grand Haven, Cadillac, Charlotte, Ludington, Coldwater and nearby.